I believe the evidence is overwhelming that Oswald was Doorman. The best way to gauge the opinions of those who may or may not agree is to compare their YES or NO answers to mine. One individual (Mr.X) took the survey (below). His responses were evasive. I specifically asked for a YES or NO answer to each question, but he failed to do so. This was not a court trial. 1: Assume Oswald was in front of the TSBD at the exact time of the assassination. If so, do you believe that’s why Det. Fritz’s notes (Oswald said he was “out with Bill Shelley in front”) were hidden for 30 years? Yes or No? X. Not solid proof of anything. RC. I did not ask for proof, just an opinion – assuming the hypothetical that Oswald was in front of the TSBD. 2: In his WC testimony, Lovelady was asked to point to himself in the Altgens6 photo by placing a DARK arrow in the DARK area. The head of the arrow appears to be pointing to Doorman who was standing on the TOP level. Frazier also placed an arrow pointing to Doorman. However, both Lovelady and Frazier stated multiple times under oath that Lovelady was standing in FRONT on the STEPS – not on the TOP level. Do you find this suspicious? X. Why don’t you provide us with the picture so we can decide for ourselves what it “appears” to show? RC. The picture is the Altgens 6 photo in the original post I linked to above. 3: If a photo, video, document or witness testimony had to be altered or fabricated to convict Oswald, do you suppose it would have been? X. That is definitely a possibility. RC. Of course it is a possibility, but do YOU think the evidence would have been altered or fabricated? 4: If a witness could confirm that Oswald was standing out front, would he/she be allowed to so testify? X. What witness are you talking about? Or is this hypothetical? RC. ANY witness. It is a hypothetical. I am just asking for your opinion. 5: If a witness called to testify could confirm that Oswald was out front, would he/she be asked the question? RC. Same answer. It’s a hypothetical. I am just asking for your opinion. 6: If a witness was a participant in the conspiracy and saw Oswald out front, would he/she be allowed to say so? X.This is speculative psychology. What is the point? RC. No speculative psychology. I am just asking for your opinion. 7: TSBD witnesses were not asked directly if they saw Oswald out front. Would it have been a logical question to ask? X. If they considered it a possibility, they should have asked. RC. Of course it was a POSSIBILITY. Therefore your answer should be YES. 8: Oswald told Will Fritz that he was OUT FRONT WITH BILL SHELLEY. The Warren Commission concluded that he ran from the 6th to the 2nd floor lunchroom in 75-90 seconds, He was allegedly seen by officer Baker and Roy Truly holding a coke but not short of breath. It’s a 10 second walk from the first floor entrance to the 2nd floor lunchroom. Do you believe that Oswald told the truth to Fritz since he already had an alibi (he saw Bill Shelley out front)? X. It’s possible that Oswald was out front, but no photograph yet discovered can prove this. RC. Yes, it’s possible (see Altgens6). But do you believe LHO told the truth to Fritz? 9: Lovelady died in Jan. 1979 (during the HSCA investigation) from “complications” due to a heart attack. The probability of a 41 year old white male dying from a heart attack was approximately 1 in 10,000. Lovelady did not testify at the HSCA. Do you believe he should have been called? X. I don’t understand the question. Was Lovelady an important witness? Would they have called Lovelady to testify at the HSCA? How many other TSBD witnesses did they call? ZERO. They didn’t seem too concerned with that end of the case at that point. RC. Not true. They called Frazier. Like Frazier, Lovelady was an important witness. 10: Many JFK researchers believe that Oswald was framed but insist that he is not in the Altgens6 photo. They claim that no one testified they saw LHO out front and that Doorman “looks like” Lovelady. But is that a sufficient response? Doorman also “looks like” Oswald. Note that Doorman’s open long-sleeve jacket/shirt (open in a V to reveal his tee shirt) is the same shirt Oswald wore at the police station. And it is different from the shirt Lovelady was wearing. X. There is not enough visual evidence to conclusively use the shirt as a source of identification. RC. But are the responses sufficient to just say “it looks like” Lovelady or that no one testified that they saw LHO in front? 11: Is it just a coincidence that TSBD witnesses are not clearly shown in Altgens6? X. What do you mean “not clearly shown?” How about giving us photographic examples? RC. I specifically said the Altgens6 photo. “Not clearly shown” means that the identity of the witnesses in Altgens6 are indecipherable (blurry and whited out). 12 Do you believe the Oswald backyard photos were fakes? X.They seem fairly consistent to me, but I wouldn’t be surprised if they were altered. It is a possibility. RC. They were proven to be fakes. But do YOU believe they were? 13: Do you believe the Z-film was altered? RC. The Z-film has been proven to be altered. But do YOU believe it was? 14: Is there at least a possibility that Oswald is Doorman? RC. “I don’t know” means YES, it is possible that Oswald was Doorman. 15: Do you believe Carolyn Arnold, a TSBD secretary, was mistaken in her statement that she saw Oswald was on the first (i.e. ground) floor of the TSBD at 12:25pm? X. She could have been mistaken. Happens all the time. RC. But she could have actually seen Oswald. What is your best OPINION? 16: Do you consider it odd that Arnold was not interviewed by the Warren Commission? X. A lot of potentially valuable witnesses were not interviewed by the Warren Commission. RC. The question referred specifically to Carolyn Arnold. She was not just ANY witness. She was CRITICAL since she claimed Oswald was on the first floor – not the 6th – FIVE MINUTES BEFORE THE SHOOTING. X. It does appear to be Lovelady. RC. If it is Lovelady, then his closed shirt proves that he cannot be Doorman. 18: In the Altgens6 photo, Doorman is wearing a long-sleeve shirt open to reveal his tee shirt. An FBI photo of Lovelady taken 2/29/64 shows him wearing a short-sleeve striped shirt that he supposedly wore on 11/22/63. Given the discrepancy, does the fact that Doorman is wearing a long-sleeve shirt seem odd to you? X. Not enough visual evidence. RC. That was not the question. I asked if it is ODD that the FBI claimed Lovelady wore a short-sleeve shirt and Altgens6 showed Doorman in a long-sleeve shirt. 19. Naysayers claim that Lovelady must be Doorman because no TSBD employee claimed to have seen Oswald out front. Since the FBI concluded within a few hours of the assassination that Oswald killed JFK, do you believe that the FBI/WC would inhibit witnesses from testifying that they saw Oswald in front, destroying their case? X. What is the point of speculating in this way? RC. It is reasonable to ask if testimony which completely exonerated Oswald would be allowed at the WC. If witnesses were inhibited from saying they saw LHO out front, then that is just additional proof the WC/FBI was determined to frame Oswald. 20: Lovelady and Frazier both testified multiple times that Lovelady was standing on the STEPS in front of Frazier who was standing on the TOP level (the first floor entrance to the TSBD). Since Doorman was standing on the TOP level, do you agree that their joint testimony is powerful evidence that Lovelady could not be Doorman? X. Maybe they moved around? RC. No. The Altgens6 photo was taken at 12:30 – the EXACT time of the shots. 1. YES. Did not ask for proof, just opinion. 2. YES. The Altgens6 photo is included in the post. 3. YES. A photo,video or document that proved Oswald was innocent would have been altered,destroyed or hidden. 8. YES. Not asking for proof, just opinion. 10 NO. Evades the fact. 11.NO. Altgens6 is altered. You have the photo, not an example. 12.YES.The backyard photos are proven fakes. 14.YES. Evades. Of course it is possible. 15.NO. Evades: Do you believe Arnold was mistaken? 16.NO. Evades.The WC would not call her since it destroys their case. 17.YES. I agree. It does appear to be Lovelady in the video. 18 YES. Evades. Doorman was wearing a long-sleeve shirt. 19.YES. No speculation. What is your opinion? 20.YES. Evades the question which is about the Altgens6 photo. The FBI reported that Carolyn Arnold saw Oswald after she had left the TSBD. According to the first account, she had left the building by 12:15; according to the second, she left at 12:25. The first statement, which she was not given the opportunity to check, is likely to be less reliable than the second, which she was required to sign. Both of Carolyn Arnold’s statements, but especially the second, corroborate the accounts of two employees, James “Junior” Jarman and Harold Norman, who indirectly attested to Oswald’s presence on the first floor at “between 12:20 and 12:25,” in Jarman’s words (see Lee Harvey Oswald’s alibi). At “approximately noon” Oswald ate his lunch in the domino room on the first floor. He then went up to the second floor, where he bought a Coke from the vending machine in the lunch room. Finally, he went downstairs and was on the first floor when JFK came past. Oswald bought a Coke in the second–floor lunch room. Moments later, he encountered Roy Truly, the TSBD’s building supervisor, and Marrion Baker, the motorcycle policeman who ran into the TSBD within half a minute of the shooting. Oswald then went downstairs and ate his lunch in the first–floor domino room. Finally, Oswald chatted with his foreman for a few minutes before going home. – Was ‘Prayer Man’ Lee Harvey Oswald? Prayer Man’s location, at the top of the steps, suggests that he is unlikely to have been a passer–by. He is more likely to have been someone who worked inside the TSBD building, as were the fourteen witnesses known to have been standing in the doorway during the assassination. All of the TSBD’s white, male, manual workers, except for Oswald, were accounted for. A process of elimination indicates that Prayer Man may have been Oswald. Of the fourteen witnesses, seven women and two black men may be ruled out immediately. The remaining five white men may also be ruled out with varying degrees of certainty. TSBD manager Roy Truly said the man worked at the TSBD. 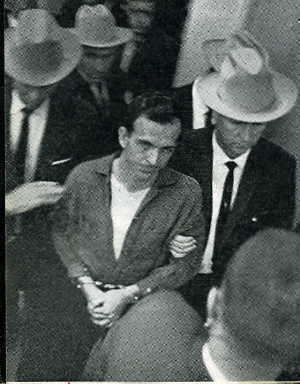 According to Occhus Campbell, Vice-President of the TSBD, Oswald was seen near a small storage room on the first floor shortly after the shooting. – Look closely to see the difference in the figure in front from the original Altgens6 Oakland Tribune photo and the Groden version. – The shirt Oswald was wearing in police custody was open in a V to reveal his Tee shirt – just like that of Doorman in the Altgens 6 photo. This is in the same category as defense attorney Johnny Cochran’s proposition put forth in the OJ Simpson trial : “IF THE GLOVE DOESN’T FIT …. YOU MUST AQUIT.” NOT true, Johnny Cochran. There’s a TON of OTHER evidence that very obviously pointed to Simpson’s guilt in THAT case. And conversely — in the so-called “case” against Oswald — too much emphasis is placed on the identity of ‘Doorman’. PLUS ….. there’s a TON of OTHER evidence that very obviously pointed to Oswald’s innocence in the shooting deaths of both JFK and Tippit. I happen to believe that the man pictured in the TSBD doorway is Lovelady. I also happen to believe that the JFK assassination conspiracy “theory” loses ground when too much emphasis is placed on this particular factor of the identity of ‘Doorman’. It’s so highly debatable whether or not it’s Lovelady. Focus instead on the thousand OTHER things which CLEARLY EXONERATES Oswald. And here’s a rule of thumb to remember : If RALPH CINQUE is fixated on something to the point of being woefully OBSESSED ….. then THERE’S a VERY RELIABLE CUE to BAIL OUT FAST! He is absolutely ADAMANT that ‘Doorman’ is Oswald. From a “positive” perspective ….. Cinque conveniently serves most intelligent [and even average intelligent] folks as a “reverse barometer”. If Cinque says it’s “purple” ….. then it is MOST LIKELY “pink” — all reflections aside! So like I said ….. I strongly feel that ‘Doorman’ was Lovelady. And I feel equally strongly that the shooters in Dealey Plaza did NOT include Oswald ….. as well as the TWO shooters of JD Tippit did NOT include Oswald. And as a former juror in three separate homicide and attempted-homicide cases in the Harris County criminal courts of Houston Texas ….. I can state with FULL confidence that IF Oswald had lived to stand trial in a FAIR and OBJECTIVE court of law ….. the INTELLEGENT jurors amongst the twelve chosen to hear his case — would have prevailed during the jury’s deliberation session over any other jurors who might have possibly argued that just because the true identity of ‘Doorman’ was a debatable question in their mind(s) ….. that the entirety of the evidence did NOT primarily rest on THAT factor ALONE. Just as it is also true of all the MANY not-so-coincidental “mysterious” deaths of witnesses that happened soon after 11-22-63 is not negated by the fact that ONE VERY IMPORTANT WITNESS by the name of Billie Sol Estes lived to a ripe old age ….. DESPITE all the SIGNIFICANTLY DAMAGING INFORMATION he knew. For whenever one truly considers it …… it’s nothing short of a miracle that Billie Sol Estes made it out of a TEXAS PRISON alive and well — and THEN SOME ….. eh?? So the fact of the matter is ….. there are no absolutes. Not everything is black or white. There is an infinite number of shades of gray. That’s what most of life in general consists of : A million and one shades of gray. Phoebe, the 20 questions stand by themselves. They serve the purpose of clarifying the evidence for the casual reader. And the evasive responses close the loop. The evidence is overwhelming that Oswald is Doorman. Could you comment on the answers provided by Mr. X? In other words, regardless of your views, how do you explain the obvious pattern of evasion? You can choose to believe what you will, but I strongly suggest that YOU take the test to to prove it to yourself. True, we don’t need Oswald in the Doorway to prove his innocence, but it locks it up completely if it is proven that he was standing there. You must realize that is the only definitive proof that will convince millions (who have no clue about the evidence) that Oswald is innocent. First ….. tell me where in the doorway photo is Bill Shelley? Which one is he? Not sure, He could be the figure in back of Oswald with a tie, or he could be on the steps. It is not important where he is standing. But it is important where Frazier and Lovelady are standing. Oswald is Doorman by the process of elimination since Lovelady is standing on the steps in front of Frazier and Sarah Stanton. Also ….. I, for one, think that the facial similarities between Oswald and Lovelady are very minimal. They could maybe — MAYBE — pass as brothers in that respect. Actually ….. more like first cousins. The strongest feature that Lovelady has that Oswald doesn’t is a strong chin / jaw line. Oswald — by contrast — has a much smaller “weak” chin. ‘Doorman’ has a chin very much like Lovelady’s. That’s why I’ve seen so much debate about whether the photo was tampered with …. to claim that ‘Doorman’ was altered to look like Lovelady. When one starts debating about whether or not the photo was altered ….. that puts me to sleep faster than Sominex. Hey Richard, “Mr. X.” here. You forgot to change question 16 from ZJ to “X.” I didn’t evade any of your questions. I answered them in a straightforward manner. Your questions are so convoluted that they are hard to answer in a “yes/no” format. For instance, you didn’t proved the portions of the photographs that you are referring to in your questions. You tried to imply that Lovelady died because of some investigation that you assume the HSCA would have carried out? You want people to enter into the minds of investigators and witnesses to try to deduce what they may have said? How can someone answer those questions? This is sloppy work once again, Richard. So, this is more of a “yes/no” questionnaire rather than an investigation? What kind of a researcher are you? If you were after the truth, like any other investigator, you should have been grateful that anyone took the time to honestly answer your “survey” and taken their answers into consideration. But, instead, true to your angry, amateurish methods, you nitpick. This is why no one takes you seriously or ever will. Zachary: I will let your lack of response stand for itself. I asked for your opinions – and you were afraid to take a stand and do so. End of story. If trolls like yourself did not take me seriously, they would just ignore me and would not expose their shameful lack of professionalism. The best JFK researchers who are interested in the truth all cite my analyses and take my work seriously. They include Jim Marrs, Philip Stahl, Jesse Ventura, Phil Nelson, Roger Stone, Richard Belzer, and many others. Is it just a coincidence that all of the pathetic one-star reviews of my book “Reclaiming Science: the JFK Conspiracy” are from trolls just like yourself? You once promised to buy the book. If you have, then review it; if not, why not? The onus is on you, Zach.